Mavic Air has been launched today, be one of the first to own one today. So what’s so special about the Mavic Air launched by DJI today? We take a look at the new drone offering which sits somewhere between the Spark and the Mavic. The Mavic Air has all of the automated flight modes you’d expect in this newest drone from DJI, including tap a button on the controller to fly. With a hot new camera,, there are some new image-capture tricks that let you take spherical panoramas, and a couple of new zoom-in shots for when you want to show off whatever impressive natural setting you’re standing in. Gesture control and obstacle avoidance makes this a great new addition to the DJI Dron range. With a top speed of 42 mph, the Mavic Air onboard new camera shoots 4K video and 12-megapixel stills, and it can take 32-megapixel panoramas. With a foldable drone that can pretty much fit in your pocket (all be it a large pocket), this is a great option from DJI. 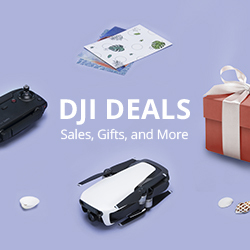 You could be one of the first to own the Mavic Air, by purchasing directly here.